I (Katherine T Owen) received healing after 14 years bedbound with severe Myalgic Encephalomyelitis. Healing bible quotes played an important part in my healing. You may ask: Have I been ill too long to recover now. Is it too late for me? 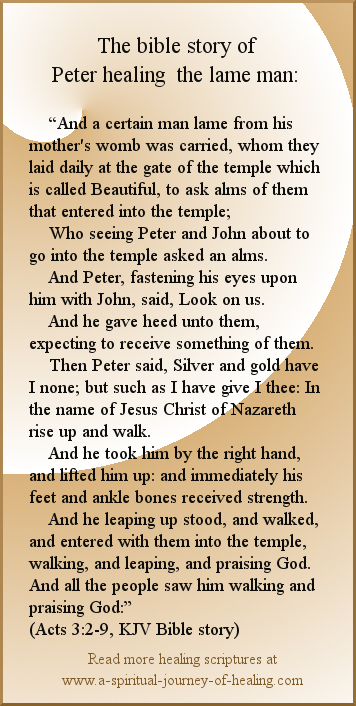 Please read the bible story in the image below. The scripture on healing in the image above answers the question: Can I be healed of longterm illness? This man was lame since birth. Have you been ill longer than that? You may think: “Even if I get better, I will have to live with the long term effects of this sickness”. To be honest, many of us would be happy with that. But the scripture on healing above allows us to practise faith for the possibility that even the long term effects of sickness can be removed. The man goes from paralysis to “walking, and leaping”. For myself, you might think that, after 14 years bedbound, I would not be able to walk normally. I can't tell you how many people told me that permanent damage was being done to my body. But I walk just fine. And I know others, who – after years of illness – do the same. You may ask: How long will it take to recover by faith? Along with many other healing bible quotes, the scripture on healing above expands our faith for the possibility that we can recover immediately. Think about it: Was there a moment when you became ill? Could there be a moment when you become well? How would that moment feel? How does it feel? Bring those feelings into this moment right now. For more on this subject, move to We Don't Have To Wait For Healing. Perhaps you are asking: do I need to be a Christian to be healed by Jesus? i.) The Centurion in the Bible quote above is not a Jew, he is a Roman. This example of Jesus healing in the Bible lets us know that you do not need to be Christian to receive healing from Jesus...or Jewish it is not necessary to belong to any particular religion to receive healing from Jesus. ii. )Secondly, we can use this scripture on healing to strengthen our belief that Jesus heals now. After all, he wasn’t physically present and yet the servant was still healed. Jesus' healing is not limited by space. iii. Thirdly, this scripture on healing emphasises once again the importance of belief. Do you believe you can not be healed? Would you like to believe you can be healed. This leads us nicely onto the next scripture. Click here for the next page of Scriptures On Healing - I Choose Life. I Choose Blessings.